In the market garden, summer squash can’t get much better than this. These guys, part of the second planting for the season, have it all. Leaves looking really healthy: green, uneaten, and so far free of the powdery mildew that inflicts itself on many squash varieties and eventually kills some off before their time. Perfectly ready for picking: These Early Crooknecks are a nice size, there’s a few per plant, and they’re quite easy to get at. All the summer squash were multiplanted, 2-3 plants growing together, so things could get pretty overgrown and hidden. This second planting set fruit fast (unlike the first round! ), and the plants are still nice and open for easy reaching in. More to come: In the small-scale market garden, you’re always thinking quantity and COUNTING. How many pieces do we need for today’s CSA shares, how many bunches for tomorrow’s farmers’ market, and so forth. You’re thinking for now, and also for Next Week, and then, more weeks ahead. In that order. Today, there are plenty of tiny squash that’ll size up in a week no problem! 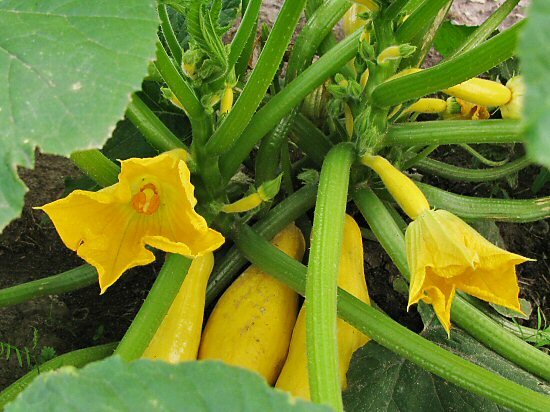 Bonus specialty selection: Squash flowers! Lots of veggies have cool options, like broccoli flowers and side shoots, squash blossoms (aka zucchini blossoms), beet greens, pea leaves, and generally, harvesting very small and young (I tend to like things to grow to a nice, solid size). So if you dropped in looking for a few squash blossoms (as seen on Food Network :), we could hook you up! So there it is, my idea of practically perfect market garden summer squash for the tiny farm harvest. There’s ALWAYS room to improve…but here, how? we had zucchini this year for the first time. i was not sure how many to plant so i started off with 12 seedlings. i realized it was way too much for my little garden, so i gave half to my aunt. so i have 6 and that is way more than we can handle. i have been giving them away to friends and family. they are already avoiding me ;) lol. i was away for 2 weeks and as a result i found half meter long zucchini. I tried a yellow variety one year and didn’t care for the taste- maybe I might give another a try again next year. I like the multiplant idea for these and will try that as well, pulling them out when they get too big and unruly (if I have more that I’ve sown to follow them, that is). So how many do you multiplant and at what distance? Happy harvesting! we bake slices in the oven with different cheeses and herbs or put into stews for volume. Great looking squash! This was my first year growing squash, or rather zucchini, and everything was going great before powdery mildew struck. Baking soda-soap spray didn’t seem to have an effect. How do you keep yours mildew-free?